Lock in a great price for YHA Napier – rated 8.1 by recent guests! Excellent location, good communal areas and kitchen. The outdoors eating area was lovely, and the whole building was great. Honestly one of the best backpackers I've stayed at. A great little hostel with a homey feel. Things feel very laid back, relaxed, and quaint...as does the whole city. The staff was very helpful with late check in request (we arrived near midnight), no hassle at all. Kitchen was pretty good with plenty of various cutlery available. Location is just perfect, can't think of any better. WiFi available and good. The kitchen layout was great with lots of space for food. The courtyard was also an added bonus. Comfortable, quiet and tidy accommodation in a very convenient location. The kitchen was well appointed and there was plenty of space to store bikes. The staff were very friendly and helpful. Fantastic location! Right across from beach, central location to everything! YHA Napier This rating is a reflection of how the property compares to the industry standard when it comes to price, facilities and services available. It's based on a self-evaluation by the property. Use this rating to help choose your stay! YHA Napier features a beachfront location, offering breathtaking views of the Pacific Ocean. This affordable accommodations comes with an outdoor courtyard, a guest kitchen and a barbecue area. When would you like to stay at YHA Napier? Guests 17 years or younger are not permitted to stay in dormitory accommodations unless that dormitory is privatized, where all beds are booked in the room and a minimum of one adult is part of the booking party. All guests 17 and under must be accompanied by an adult for any booking and that adult is responsible for actions of all the youths within that booking party. Toilet and bathroom facilities are shared. Linen is provided. The price is based on 1 guest. This heated, private room comes with linen. Toilet and bathroom facilities are shared. House Rules YHA Napier takes special requests – add in the next step! YHA Napier accepts these cards and reserves the right to temporarily hold an amount prior to arrival. great hospitality and clean rooms. Location is close to everything, perfect ! Comfortable room, warm overnight Great Ocean view! Lovely staff and very easy check in and check out. Good facilities Close by to everything you need and all the hot spots in Napier, ocean right in front of you! - The equipement are a little old. 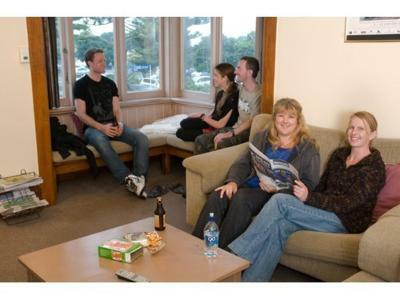 - Very friendly hostel where it is easy to meet some people. - The 4 beds room was very huge. - Clean - The kitchen is well equiped. - Amazing location next to the sea to see the sunset. Clean and comfortable, convenient location. The door that banged in the night due to the wind drafts. I there didnt appear to be many spoons amoung the cutlery in the kitchen. 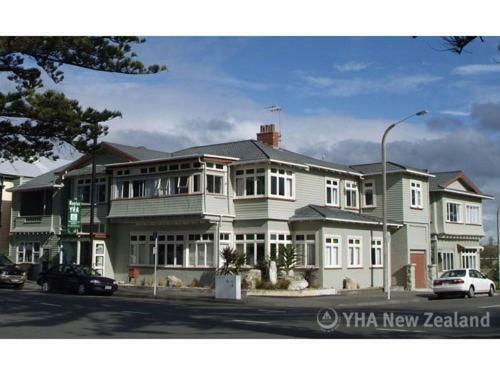 The location on marine parade within a few minutes walk of Downtown Napier and many of the tourist attactions such as the old prison and museum. It was also a short walk in the opposite direction to the National Aqurium. I was lucky enough to have a fine dawn one morning and saw a brilliant sunrise. Location was on point, proprietor was welcoming. I would ban the use of cool bags, boxes etc from fridges. They take up too much room. Replace with reusable plastic bags. They appeared to have upgraded the property since last I was there. Good kitchen with good fridge capacity and stove tops. Comfortable beds and good showers. Quiet at night. Soap didn't get filled up. We arrived at 3pm and left at 10am. The House was getting on in years; some things need to get renovated. Creaking floor boards in hallway outside bedrooms. Restricted street parking around hostel could pose a problem for those staying during the week days. Recieved a warm welcome on arrival from friendly manager. All questions answered about local area. Lot of information available about activities in the vicinity. Great view from windows in our room. Pleasant communal area adjacent to kitchen and with outlook over the waterfront promenade. Well appointed kitchen facilities. Several bathrooms available for use. Close to shops. Great location. House with character. Great showers. Helpful manager. Great to have a single room!